Take a drive down 12th Street and you'll notice a lot about Erie. There are a fair number of discouraging sights that suggest a bumpy road for this city – quite literally, as cars going 10 miles per hour under the speed limit dodge potholes while cars going 10 miles over the speed limit dodge the cars that go 10 miles under the speed limit. Still, amid buildings that have seen better days lay markers of a healthy present – and future – of The Flagship City, whether they be signs of established companies, like Smith's Provision Company, newer businesses like Lavery Brewing Company, or the still-fresh walls of the Cathedral Prep Events Center. There are several books-worth of history along this east-west route, with different chapters holding 12th Street in place from the north and south, new tales breaking off down State, Cherry, and every other street that comes in contact with this key stretch of road. On 12th Street, thousands of people travel to different destinations every day. Some go to and from work, others to class, some out to I-79 to head elsewhere, and – this may come as a surprise to those naysayers that feel as though Erie is not a city great enough to bring in talent that wants to stay – some come in from I-79 to be a part of this town. Yes, there are those that don't give Erie a chance and others that will forever be entrenched in small-town status. But others see potential in this town to do great things. It's the latter group that has seen the future and is making an event like the Perry 200 Grand Patriotic Parade theirs. You see, 12th Street – already a microcosm of Erie life – will serve as the grounds for a parade starting at 1 p.m. Saturday, May 25. This parade will usher in a summer's worth of Perry 200 Commemoration events, all part of an 18-month stretch that began last year – you may remember Managing Editor Ben Speggen's cover story on the Commemoration last spring – that will help our fair citizens celebrate and recognize Erie's role in Commodore Oliver Hazard Perry's victory in the Battle of Lake Erie during the War of 1812. Now, you may ask "How can this little parade inspire this city to get behind its history in such a manner that it can show its populace what The Flagship City has the potential to be?" Well, fair Reader reader, this isn't your average little parade. This is a 1.8-mile route starting at 12th and Cherry streets, that heads east down 12th before hooking a left on State Street and finishing up at Third Street, with 65-foot helium balloons, plenty of floats, and, of course, you. "We're expecting around 100,000 people to be in attendance," Dan Mucci says. My eyebrow raises as the words leave the Jefferson Educational Society's primary researcher and Perry 200 event coordinator's lips. "I've had some people come into the office or call me on the phone and tell me how they have relatives or friends who are out of state that are going to be coming in for this parade. I think we're going to get a lot of people from a lot of different states." I glance around the Starbucks the two us are currently sitting in and eye about 20 people partaking in their beverages of choice. Assuming the number Mucci has estimated is correct, we're looking at a gathering of about 5,000 early evening Starbucks crowds for you caffeine junkies out there. While the number may seem high at first, it's not like this town hasn't seen an event like this before, with the Erie Bicentennial Parade in 1995 drawing in large crowds as well. Of course, given the Perry 200 Parade is in honor of the 200th anniversary of Perry's victory over the enemy in our Great Lake to the north, there's reason to believe that if they run it, people will come. And, as you might have noticed, Erie is down with O.H.P. "We felt that, given the parade in '95, we should have one for this as well, so we're going to try and top it," Mucci says, resting his head in his right hand as he taps his forefinger against his upper cheek. "It should be a special event for our community. [The Battle of Lake Erie] was a decisive victory for America and put Erie on the map, so I think that's why he's so revered here." 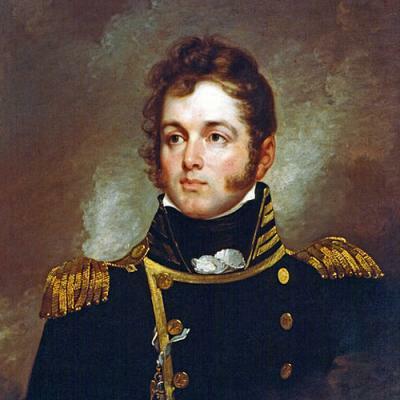 Given the community's attachment to our beloved Commodore, the Perry 200 Commemoration Commission members – a group of nearly 90 Erieites operating under the watch of the Jefferson Educational Society – have been taking their time in order to make the 18-month stretch as memorable and effective as possible. According to Mucci, the Perry 200 Parade has been in the works for the past two years. "It's a huge effort," the fresh-faced project coordinator – who does a mean Christopher Walken, by the way – explains. "We have a parade committee and pretty much everybody on it is a volunteer. Ray Luniewski, the co-chairman, is a volunteer, Michael Fuhrman [Destination Erie: A Regional Vision Project Manager and fellow parade committee co-chairman] is a volunteer. They all have full-time jobs somewhere else and they're volunteering their time to help make this parade the best it can be. When you've spent this much time and this much effort organizing something, you want it to turn out the best that it can be, so we're going to make sure that happens." As it stands, most of the details about the parade are set: roughly 190 units, 50 different floats, and nine big Macy's Day Parade-style balloons will take to 12th Street May 25. However, the committee had a different vision for the parade back in its infancy. "The original thought was to go with a very large military parade," Ray Luniewski tells me over the phone. "As we talked about it, it didn't seem like that was going to have the right flavor to it. We really struggled to get anything from the United States military to come in to a parade such as this, but we also thought it might not be the proper celebration. We swung it around and settled on this grand, patriotic idea, which seemed to roll the military into it but also included a whole lot of fun." Instead of the military parade, the projected crowd of 100,000 will be treated to a wide variety of visual treats, including over 20 marching bands and drum corps that will perform throughout the parade. Banners representing the nine American ships will sit on one side of the street in blue, while six red banners stand for the British boats on the other, playing into the Battle of Lake Erie. Certain businesses will tie their livelihoods into the 1813 theme, with displays of a ship's galley and how other elements of Erieites lives differ in the 200 years between then and now. While the parade snakes to Third and State streets, the committee has entertainment planned for Perry Square of the musical variety, as well as something of a surprise performance, as well as the aforementioned massive helium balloons will make their return for the first time since the '95 bicentennial procession. You see, this isn't Luniewski's first rodeo when it comes to putting on a parade. "Oh, I've dabbled around in a lot of them, yeah," he laughs. "I've done a lot of different stuff with parades in Erie." Part of the reason Luniewski was brought in to really shape the Perry 200 Parade was that he had a major hand in the bicentennial parade back in '95. In addition to that, Luniewski also acted as director of Erie's own bugle corps, the Lake Erie Regiment, before it was disbanded in 2006. "I work at Gannon University as an electrician there – that's what I really do for a living – but I've always been involved with the marching bands and the drum and bugle corps in Erie," Luniewski says, an affection displayed by the excitement in his voice when he describes the performers coming into Erie for the Perry 200 Parade. It's unfortunate that our conversation is over the phone, because I can imagine the co-chairman's eyes lighting up as he happily describes the Cadets Jr. Drum and Bugle Corps, the Woodland String Band, the Preston Scout House Band, and all of the other talented performance groups that always maintain space in Luniewski's grey matter. He knows that these bands will be awe-inspiring and he's confident that this latest parade he's helped build will be something Erieites will remember for decades to come. "Physical numbers-wise, I don't know if it's going to be the largest in that regards, but I know it's going to be the most spectacular by far. It's going to blow '95 out of the water," Luniewski says. Of course, there's only so much that the man can account for. Even with the years of planning and the meticulous details that have gone into creating the Perry 200 Parade, there's one major thing that can stand in Ray and the Parade Committee's way come May 25. "We got our shot, we got our date, we just got to hope for the best," Luniewski says when the prospect of Erie's fickle climate is broached. "That's kind of the pitfall of doing an outdoor event. Hopefully the weather cooperates." He doesn't sound too worried about the prospect of bad weather, although he knows lightning or high winds could mean bad news for the parade. He says there is no backup date for the parade, so while the committee is plenty prepared in case of delays, Mother Nature could swing through with a case of they greys and cancel the event for good. Instead, he's resigned to the fact that Erie's weather will do what it wants – the wishes of humanity be damned – although that doesn't prevent the committee from trying to get a sneak peek at the future. "In '95 – I kid you not – we went to the almanac, and it was like 'rain, rain, rain, sun, rain, rain, rain,' and the 'sun' date was the day of our parade and we couldn't believe it, but that day, although it was kind of cool, was a sunny day," Michael Fuhrman recalls after I meet him at Under the Clock one warm Thursday evening. "I haven't checked the almanac yet, so you'll have to do that and see what's happening." The Destination Erie project manager and Parade Committee co-chair is sitting at the bar awaiting a dinner that he's trying to sneak in to his busy schedule. He teamed with Luniewski back in '95 for the bicentennial parade, so it seemed natural for them to team up again 18 years later and volunteer their services along with the rest of the Parade Committee. "Based on that experience, Ray was the driver, he was the conductor. I provided the resources and helped bring in the specialty units, but Ray was the architect of it," Fuhrman says, setting his fork down on a plate of ahi tuna that recently arrived. "[Jefferson Educational Society President Dr.] Bill Garvey, who was the mastermind behind this whole thing, I would like to call him sort of 'Oz behind the curtain;' when he launched the bicentennial in 1995, he set in motion these types of events, so when he took over the Perry 200, he went back to that moment in '95." Fuhrman shies away from describing his role, instead focusing on the others involved in the planning of the parade, going as far as to say that without Garvey, there would be no Perry 200. Not to be left out, Fuhrman is sure to shower praise on his co-chair Luniewski, even going so far as to call the May 25 march "Ray's parade." He's just fine with that, as it helps make the Perry 200 Parade a symbol of what Erie can do when provided the chance. "Ray is a reflection of what the product of Erie can be if given the opportunity to produce," Fuhrman says, jabbing his forefinger into the marble countertop of the bar to emphasize his point. "He's like an unsung hero in a lot of ways, just one of those characters who's unassuming, but when asked to do something for the community, he rises to the occasion and does something that impacts it in a way that business or politics could never do. That's powerful stuff. You think, 'Well, the guy works in maintenance,' but he'll come and put on this huge parade. That's passion. That's love. That's amazing." For Fuhrman and the other members of the Perry 200 Parade Committee, this event means so much more than your average parade. This is a chance to show just what Erie can do despite what all of the non-believers think. Yes, there will be plenty of people that won't show up and won't cheer on the sidewalks of 12th and State streets when the city blocks off major sections of downtown to celebrate its past. There will even be those among the projected 100,000 Erieites and outside supporters who will attend and will enjoy the giant balloons and pageantry and still not think of the parade as a sign of what Erie can do when given the chance. However, there will still be people that see this display of grandiosity and be inspired by it, joining the ranks of the Michael Fuhrmans, Ray Luniewskis, and Dan Muccis that keep fighting to make The Flagship City as great as it can possibly be despite all the bumps, bruises, and potholes it has taken along the way. "You're going to have people on the high end who take civic responsibility and move forward. Then you've got people on the low end who are just going to be jerks," Michael says. "The fight is over the middle. The fight is over trying to get the majority of that middle to move up. Something like this galvanizes the community and inspires it and gives it that injection of momentum. When that opportunity arises like it has in 2013 and you seize it, it reinforces the confidence that the community we're living in is still chugging along and fighting it out. We're still in the arena, taking our knocks and getting hit down, but we're getting back up. GE may leave, but you know what, dammit, we're Erie people and we're going to chug it out." Erie is a tough town, and its citizens are a tough people. The economy is still down, jobs are being lost, and yes, there are plenty of potholes. But we've fought through it this far and we can continue to do so. You may have noticed in some of the Reader's recent cover stories that there are people that care about this town and are succeeding within it, whether it be a herd of hip-hoppers that love this town, a contemporary theater group that's rising to the occasion, or a batch of 40 individuals under the age of 40 that show that not all the talent is fleeing in every direction. These are some of the people that embrace our history and are trying to add to it. "To me, that's life," Fuhrman says, leaning back in his chair. "That's the experience of life, so when Ray's kid gets older, he can say 'My dad did this.' Hopefully that will inspire him to say 'I'm part of this lineage, I've got a calling somewhere.' That's why I do it. That's why we all do it." For one day, 12th and State streets will be transformed. Gone will be the slow drivers and blemishes, replaced by a grand celebration that doesn't happen often – the Brigadoon moment of a historic city with much history left to make. However, after the cheers die down and the physical remains of the parade get swept away and the mists of time recede back into the annals of history, the spirit doesn't have to go away. Big things can come our way – we just have to fight for them. We have seen the future, and it is ours.